Anyone else on the no-carb plan? My doctor advised me that I was taking in one too many carbohydrates, so I have been trying to find ways to eliminate them – or let’s be honest, put them on the portion control plan. But, this was a direct shot to my heart. I love pasta! And, it’s cheap, so it fits rather nicely in my itemized and limited budget for groceries. Regardless, I’m following my doctor’s orders, and I am at least trying as best as I can to keep my same diet, just with substitutions! I simplified this recipe though. I was exhausted when I got home, but I really want to try this! I boiled water with a pinch of salt, put the broccoli slaw in the pot, and simmered the water and slaw it until it was tender. After draining the water, I added my sauce (obviously didn’t save any calories with that choice, but I was tired and hungry). I cooked the sauce and slaw just a few minutes more, just to give the sauce a little soaking time. Dinner was served, and in about 10 minutes! Now, this is not as good as the real stuff, but it really was pretty tasty. I could hardly taste the broccoli slaw! I probably more of a mental thing, so maybe the next time I make it, it will taste exactly like pasta! I made way too much (since I put the whole packet of slaw in the pot), and the leftovers were terrible the next day. When I make it again, I’ll only make as much as I want for that night. Overall – pretty good dish, great price for a meal, and gluten-free! Added to my recipe rotation – for a main dish or a side! Well, I got a juicer for $1 at Target. 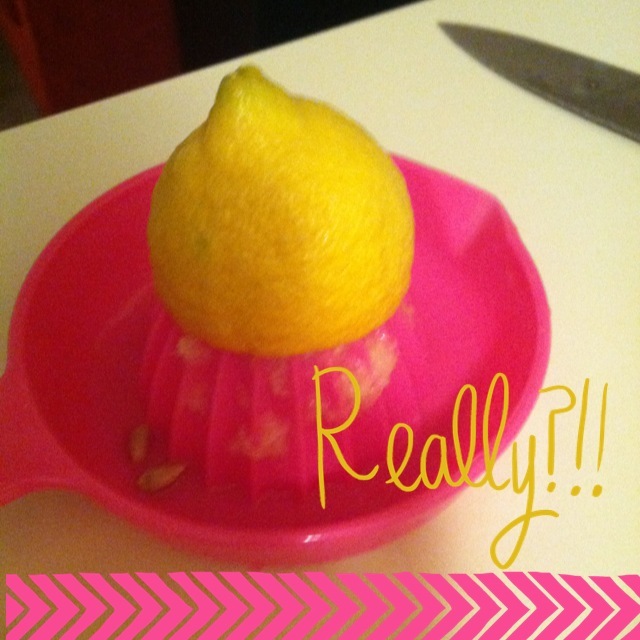 I’m fascinated, mainly because I always feel like I never get all the juice out of my lemons. No more! Time to try a new recipe – Hungry Girl time! – Package of veggies for fajitas (in the produce section of Kroger): includes peppers (red and green) and onions. They are already sliced and ready to go in the pan. Cook the quinoa as the package directs. TIP: Wash the quinoa first. It will taste a whole lot better if you will. Mine took about 15 minutes to cook. In another pan, I sauteed the Kroger package of pre-sliced onions and green and red peppers – how helpful! I realize it doesn’t really take that much time to cut veggies, but since this package was basically the same price as peppers, and buddy, I threw it in my basket! I added a little olive oil, and in just a few minutes it was done. Whisk together the juice of one lemon, 1/3 cup of olive oil and a little salt. 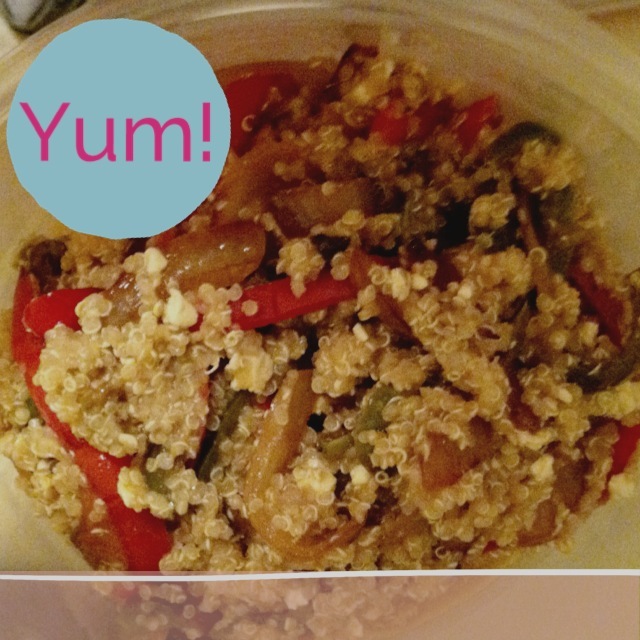 After the quinoa was cooked, drained and cooled a little, I added the peppers and onions, lemon vinaigrette, and then the feta cheese. You want the feta to melt a little, but not entirely. Great recipe, and I need to remember for Meatless Monday!